Are You Ready to Start Planting Tomatoes? Planting tomatoes is fairly easy, if you know what you are doing. You have your 4-6 inch seedlings (either home grown or purchased) and you're ready to go. The steps you take when planting your tomatoes will have a direct effect on the quality and quantity of the fruit that will be produced. 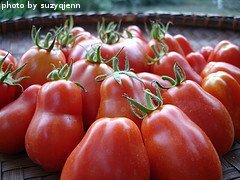 Tomatoes should be planted in your garden no earlier than 2 weeks after the last expected frost in your area. Tomatoes are usually ripe and ready to pick 70-80 days after planting them in your garden, depending on the variety. If you're growing just a couple of tomato plants, they should be planted 3 feet away from any other plant in your garden, including other tomato plants. This should give you enough room to walk around the plant when fully grown. It will also lessen the chances of diseases developing. Furthermore, a tomato plant will develop a large root ball and will use lots of nutrients in the soil. If the plants are placed too close together, they will end up fighting for these vital nutrients and the quality and quantity of fruit will suffer. If you are growing lots of tomato plants and are really trying to maximize space, you can place them 24-30 inches apart within the row and space the rows 3 feet apart. Once you have adequate space allotted for your tomato plants, it's time to put them in the ground. The first step is to dig a hole a couple of inches deeper than your seedling is tall, and about twice the size of the root ball. Then backfill the bottom of the hole with a couple of inches of loose soil. We often use compost or topsoil to fill the bottom of the hole. This gives the tomato seedlings plenty of nutrients to grow and develop a good root system. 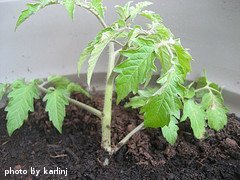 Take the tomato seedling out of the container (roots and soil too) and use your fingers to gently spread out the roots. Place the seedling in the center of the hole. It should stick up about 2 inches above the level of the ground at this point, with just a couple of sets of leaves. If it sticks up higher, you need to dig a deeper hole. If it doesn't stick up high enough, add more dirt to the bottom of the hole until the plant sticks up high enough. Once the depth of the hole is right, fill in the sides and top of the hole with dirt. Continue adding dirt to the hole until it is level with the ground, tamping it down lightly. When done correctly, most of the stem will be covered with dirt and approximately 2 inches of tomato plant should be visible. It seems kind of strange planting tomatoes so deep, but there's a good reason for this; the part of the plant that is below the ground will change and become part of the root ball. This will produce a much stronger tomato plant because the root system will be more extensive. The larger the root system, the easier it is for the plant to absorb water and nutrients from the soil. A stronger tomato plant can focus more energy on producing fruit, rather than just trying to stay alive. If you are planting tomatoes in a container garden, choose at least a 5 gallon container and follow the same steps listed above. Always remember, when planting tomatoes - PLANT THEM DEEP! After planting tomatoes, water them in carefully so that none of the soil is washed away. Hold off using any fertilizer or plant food at this point. An accidental overdose of plant food now would make for a very large, lush plant that won't produce much fruit. Better to wait until the plant gets a little bigger before fertilizing. You should also wait a few days before using tomato cages or stakes. Let the plants get settled and then worry about how you're going to keep them off the ground when they mature.